The Soaring Sheep: New Project? I can't decide why I'm so tired at the moment. It could be the end of term busy-ness, it could be not sleeping very well or it could be the new medication I'm on. Either way crafting has rather taken a back seat lately. 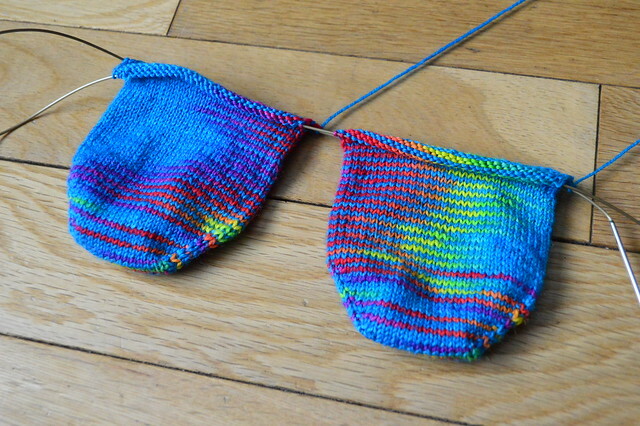 As you can see I've done a bit of work on these socks for Mr Soaring Sheep. Plain vanilla is about the level I'm capable of at the moment. I'm itching to cast on a beaded lace shawl or some sort of sweater for me but at the moment it's too daunting. 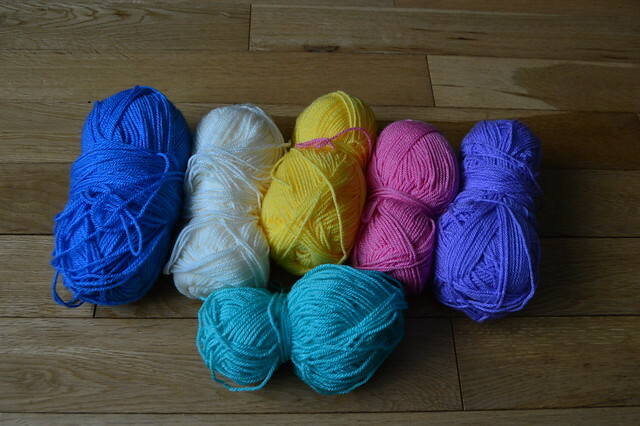 I have pulled together this collection of colours to make some sort of blanket out of. Problem is I'm not really sure what I want to do! I'm thinking some sort of solid block design, maybe squares maybe hexagons? Perhaps something slightly lacey? I dunno, I'll have a flick through a couple of pattern books and see if anything jumps out. Thank you for the kind comments on my previous post. I'm sorry I'm not very good at replying at the moment. Everything is just feeling very difficult right now. Fingers crossed I get some more energy over the next week or the 6 week holidays are going to be very hard work indeed! So sorry you're feeling washed out right now, hope you get to the bottom of it before the holiday. I hope you feel energetic soon, new meds can make you tired! Love the colors you pulled together, I know you will make a beautiful blanket!